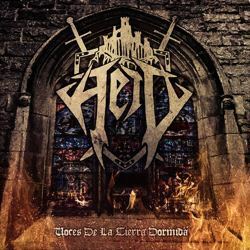 Spanish pagan folk black metal band Heid from Madrid have released today their debut EP “Voces de la Tierra Dormida“. The conception of Heid dates in the Spring of 2011, but it actually took a complete “form” and line-up in 2012. In January 2013 they released a 3-track demo and now on March 7th 2014 the 28-minute EP “Voces de la Tierra Dormida“, which includes 5 tracks. Heid combine Castilian folklore with black and death metal, singing in their native language and using local traditional instruments like the bandurria (mandolin) or dulzaina (flute). “Voces de la Tierra Dormida” is released only in digital format so far and you can listen to it in the band’s official Bandcamp page following the links below.